I’ll put the Nendoroids in the header. Everyone loves nendos. This is a little something I’ve had in my back pocket since the beginning of this writing challenge. I’m in a position where I have to write three articles in one evening, and with two down it’s starting to get way too late. So here are some crappy iPhone pictures of my nerdy toys, with occasional commentary. It’s a bit of a shame, since I just moved and not all of my stuff is properly displayed. Hopefully you will get a kick out of what I’ve got out though! Aaaaand its sideways. Of course. Too tired to figure out how to rotate it. Ah well there are close ups following. Brief funny story on these. My brother got me both for Christmas (with some help from mom and dad). The Gore Magala is one of my favorite monsters, but he got me the Rajang specifically because I told him how much I hated that fight. The funny part? I got him a plush Teostra because it was his least favorite monster to fight! We had a good laugh at how terrible we both were. Why didn’t they make a 20th anniversary figure for Genesect? Why just leave him out? Pokemon 20th anniversary figures. I love the boxes, so I can’t bring myself to take them out. That Lucina figma was my first proper Japanese toy. What a slippery slope that ended up being. Yeah I’ve got some Funkos. No, I don’t feel good about it. Some miscellaneous things. 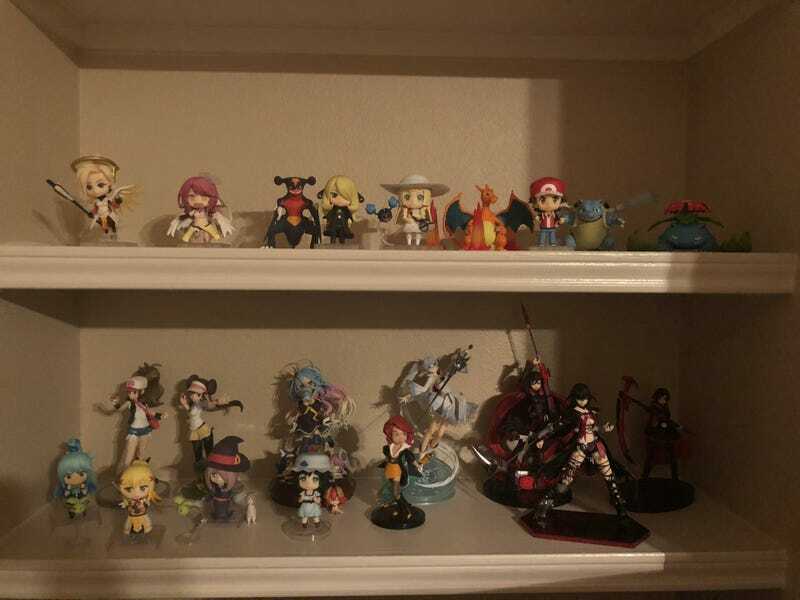 I like those blind box RWBY figures, I might try to complete the set one day. Same picture from my amiibo article. Quite proud of this collection, though it does slightly irritate me that its not complete. I’d have to drop a few hundred to get it that way, so I think I’ll hold off for now. Let’s wrap this up with my rarest Pokemon cards. I forgot to include my Shining Mew, but oh well. As you can see (if you know Pokemon cards), I’ve only recently started collecting.